Follow on Twitter & Facebook..
20 years as the Head Coach at Catawba College! 12 years as a Divison 1 Ast. Coach at Davidson, Virginia Tech, & VMI! 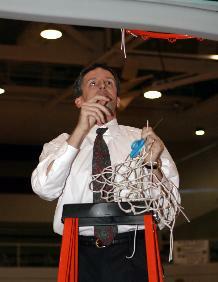 Jim Baker took over as the head coach for the Catawba men's basketball program in 1994 and his overall record stands at 344-236. During his tenure, Baker has guided the Indians to the NCAA II Tournament nine times. His teams have won just over 60% of their games and have an impressive home record of 198-74 (73%). Catawba had a 108-70 record in games decided by five points or less under Baker. Baker produced three conference Players of the Year and three All-Americans, while graduating 60 of 64 seniors. 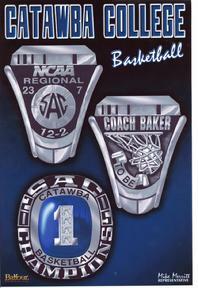 Baker was named SAC and NCAA II Region Coach of the Year in 1998, after Catawba posted a 25-6 record. He also earned SAC Coach of the Year honors in 1996, after he guided the Indians to their first conference title since 1983. His 16 victories in his first season was the most ever for a first-year basketball coach at Catawba. He has a 306-166 record over his first 16 seasons and ranks second all-time in coaching victories at Catawba with 344 wins. 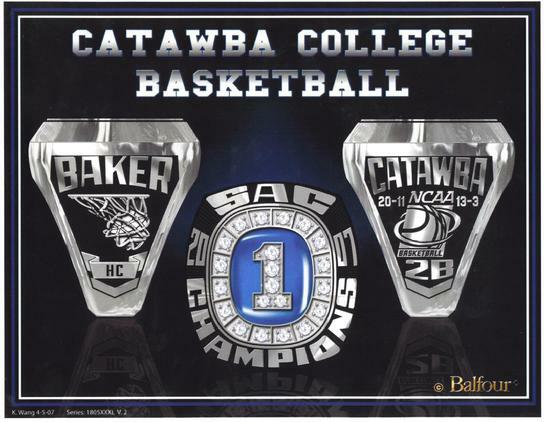 Of the 26 championships won in basketball at Catawba College, Jim Baker was a part of 13....12 as head coach and 1 as a player! Baker began his coaching career as a graduate assistant for Moir in 1978-79 and at Wingate the next year, while earning a master’s degree in human development and learning at UNC-Charlotte. He was also an assistant coach at Belmont Abbey (1980-81). Baker worked under Bobby Hussey at Davidson, Frankie Allen at Virginia Tech and Joe Cantafio at VMI. At Davidson, Baker was part of a program which graduated 25 of 26 student athletes. In addition, the Wildcats put together back-to-back 20-win seasons (1986-87) and appeared in the 1986 NCAA Southeast Regional. While Baker was at Virginia Tech, the Hokies became only the third team in Metro Conference history to sweep both Memphis State and Louisville in the same year. At VMI, Baker was responsible for recruiting, scouting, practice and bench coaching, public speaking, summer camps and scheduling. All of VMI’s seniors graduated during Baker’s stay there and he was part of an outstanding recruiting class in 1992-93, which saw three freshmen make the starting lineup. In addition to editing and publishing a monthly basketball newsletter (“Time Out”), Baker has published four booklets: “Power Post Play,” “Striving for Excellence,” and “The Best of Time Out, Books One and Two.” Baker has also released a one of a kind basketball CD-Rom “The Best of Time Out”. Baker just released a new book entitled, "Why Winners Win and Losers Lose", which is a collection of motivational and leadership concepts he has developed over his coaching career. Baker comes from a strong sports family. Both his mother and father were outstanding athletes and his dad, Walt, coached him at North Rowan High School where he graduated in 1974. The field house at North Rowan is named in his dad’s honor. His brother, Chip, is a longtime assistant baseball coach/director of operations at Florida State. Baker and his wife, the former Tina Waters, reside in Concord. They have four children, Jamie, Madison, Hannah and Jacob. BUILT CATAWBA BASKETBALL CAMP (TIMEOUT BASKETBALL CAMPS) INTO ONE OF THE LARGEST IN D2 WITH OVER 20.048 KIDS ATTENDING IN 24 YEARS AND 1,631 TEAMS HAVE ATTENDED CATAWBA TEAM CAMP.